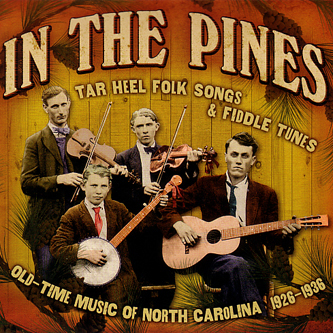 This compilation draws together rare recordings made between 1926 and 1936, all originating from the 'Tar Heel State', North Carolina. The disc is crammed with twenty-four bluegrass and country songs, all presented with background notes in the accompanying booklet, giving some historical context for the artists in question and the songs themselves - the title track is probably the best known of all the entries here, and Smog fans will recall an especially excellent rendition by Bill Callahan on his A River Ain't Too Much To Love LP. In this instance 'In The Pines' is performed by singer and banjo player Dock Walsh (now there's a proper country name) who adds some new verses to the original Civil War-era lyrics, throwing in a ghoulish tale of a young lady beheaded in a railroad accident. Further on in the compilation you'll encounter a re-reading of the song, transformed as 'The Longest Train' by Mainer's Mountaineers. There's a lot more to this music than this one enduring song however, and in here you'll find gospel tunes, murder ballads, mountain songs and probably a good deal more fiddling and banjo twanging than your average mortal could handle. An excellent release, this. It lacks the deluxe boxset treatment you might get from Dust To Digital or Revenant, but the recordings are given detailed accounts with rare archive photos included throughout.